It's a good job she's cute. - Who's the Mummy? It’s a good job she’s cute. If there’s one thing Flea and I can fall out over, it’s mess. We did recently create a playroom in the loft of the house which I think pretty much saved my sanity. 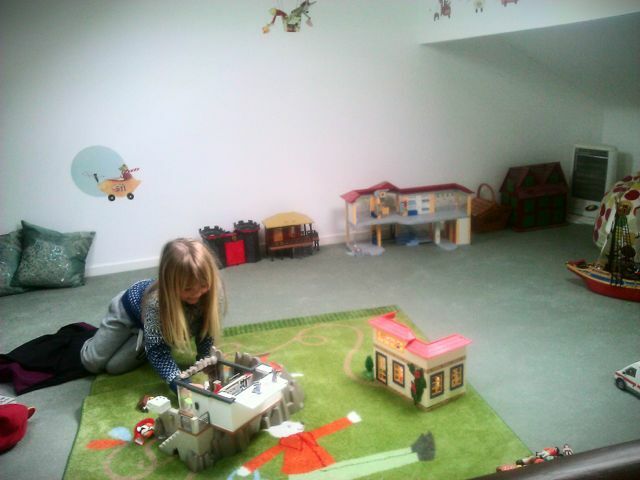 Although, it has to be said that Flea turned the playroom from a Zen space of calm and tranquility into a palace of Playmobil and Potter within the space of a week. And, as I think has been proven on this blog before, I like me a bit of order and tidiness. Yes, I organise my mug cupboard. So, sue me. But if it’s in the playroom, I don’t see it. Two minutes later I was carrying a pile of laundry up the stairs and almost broke my neck on the big Harry Potter book we picked up on our visit to the Warner Bros Studio tour last month. “Well, Mummy, I thought that was a bit more like a pamphlet, so it didn’t seem appropriate to take it,” Flea replied. And this, friends, is what happens when the father of your child is a programmer. LOGIC. Always with the sodding logic. Previous Post Are people who send their kids to private schools snobs? Next Post How to be a terrible daughter. I cannot even discuss kid mess without some form of chemical calmness inducer. Darn comment box wouldn’t let me paste!! That made me laugh, quite a lot. Why does cute work?….wife to 6-y-o daughter: Are you reading your book tonight? Daughter: I am too tired (an often heard refrain that leads to a long debate and usually a negotiation over total page count). Wife: OK, you can watch a little tv instead. Daughter, combined with innocent smile: Oh good, so its not a pushy night tonight then? Oh bless her, so logical. I have to say that you have the tidiest playroom in the world if that is it in full flow. To me it’s a den of chaos and disorder. Enjoy it while she’s cooperative. My 13 year old says she can’t relax unless her room is messy. She likes a nest of messiness on the floor to curl up in. So my policy is to keep the door closed but persuade her to tidy it every few weeks when it’s smelly. Ha! I think my Mum had a similar policy when my 3 brothers were teens! Oh no…my children have 2 computer programmer parents! She likes showing off with posh words. Gets that from me. The logic? All from her Dad. Anything that is left out in our house that I’m complaining about is explained in this way: “but I am using it right now”. Drives me mad. I think I’d prefer the Harry-Potter-tome-as-a-pamphlet approach, for the amusement value. I sometimes get, “I haven’t quite finished.” Which means it may get picked up at some unspecified time in the future – so why oh why can’t it be away until then?? Children’s toys that are not picked up go in the ransom box and they have to pick a chore to complete to earn it back! A great lesson in personal responsibility. Hmmm, tempting but then the box would take up more tidy space…..Food for thought though.. I love this idea…. I may be trying this with my two. Meanwhile, I’m trying to train my dogs to pick up the toys as they seem to do it with less fuss and more efficiency than the kids. I am the world’s messiest mother so will be interesting to see what my house looks like once the little dude is mobile! That’s brilliant, she is a clever cookie that one! Ramblings Of A Suburban Mummy recently posted..Tea and Cake! jane @ northernmum recently posted..Real life parenting: warning contains shitto…. OOh what a clever girl! Teenage years should be fun mind! Hey Buddy!, I found this information for you: "It’s a good job she’s cute.". Here is the website link: https://www.whosthemummy.co.uk/its-a-good-job-shes-cute/. Thank you.